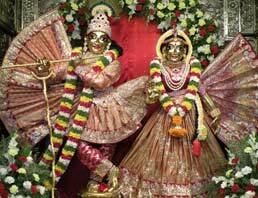 Brahmotsava is celebrated for twelve days commemorating the appearance of the Deities at Hare Krishna Hill. On the evening before the first day of the festival, there are many important rituals performed as a preparation for the festival. Vishwakasena Aradhana: Vishwakasena is the commander-in-chief of the Lord in Vaikuntha, and is worshiped first seeking protection for the festival from any obstacles or evil. Punyahavachana: Sri Sudarshana, the disc weapon of Lord Krishna is invoked into a kalasha (water pot) in order to sanctify the water. He is offered shodashopachara seva along with Vedic mantras. Once the offerings to Sudarshana are over, he is ceremoniously sent back. The water thus left behind in the kalasha is the most sacred water and is used to purify the festival paraphernalia, the yaga-shala (sacrificial arena), paka-shala (the cooking place), temple premises, etc. Raksha Bandhana: This is not the same as the Raksha Bandhana festival celebrated in northern part of India (Rakhi). Raksha is a sacred thread that is tied around the wrist as a protection from evil or untoward forces. The ritual involves invoking Sri Sudarshana, the destroyer of all evils, onto the sacred threads smeared with turmeric paste. Sudarshana is requested to reside on the threads and the threads are then tied to the right hand of all the Deities, except Srimati Radharani, for whom it is tied on the left hand. Devotees engaged in various services tie the raksha so that they can be protected from all the contaminations and evil influences that can hinder their service during the 12 day festival. This thread remains on the wrist till the conclusion of the Brahmotsava festival. Mrt-Sangrahana: Sacred mud for planting the seedlings is collected from the goshala (cow shed). The cows are very dear to Lord Krishna and the dust in the cowshed or the dust that rises from the hooves of the cows and calves are considered to be always pure. First, sanctified water is sprinkled on the soil. The ashta dikpalakas (the eight demigods who protect the eight directions) are then worshiped. Bhu Varaha, the Supreme Lord who appeared in the form of boar to save Mother Earth from the demon Hiranyaksha, is worshiped and offered various upacharas. Devotees chant Bhu-sukta prayers glorifying Mother Earth. Then with her permission the earth is dug to collect the mud. Vainateya Homa: Vainateya is another name of Garuda (the son of Vinuta, the chaste wife of sage Kashyapa) Garuda is invoked in the sacrificial fire and offered oblations. This is followed by Vaishnava Homa, offering oblations to the devotees of the Supreme Lord who appeared on this Earth to participate in the Krishna-lila and later in Chaitanya-lila. Devotees also offer oblations to the guru-parampara. Ankurarpana: After the conclusion of the homa, the collected mud is brought to the festival arena in the temple hall. Eight pots are half filled with this mud. Sanctified sprouted grains of nine varieties (Bengal Gram, Wheat, Horse Gram, Green Gram, Rice, White beans, Black Sesame seeds, Chick Peas, Black Gram) are planted into the pot. Sanctified water is poured on these seedlings. The ashta dikpalakas are invited to reside in the eight pots till the conclusion of the festival. The pots are placed in the respective directions of the dikpalakas residing in them. In the middle of these pots, soma kumbha, water pot invoked with the presence of Soma devata (Moon God) is placed. The growth of seedlings indicates the presence of dikpalakas in the temple. Whichever seedling grows taller shows the dominance of that dikpalaka during the festival. Garuda-pata Pratishta: After Vainateya Homa and Ankurarpana, Garudadeva is requested to reside in the flag to be hoisted on the dhvaja-sthambha next day marking the beginning of the festival. Sri Garuda takes his position in the center. Devotees recite Garuda Dandakam and this is followed by a maha mangala-arati. In this way Garudadeva is invited to preside over the festival.